Ocean Cove is 15 minutes north of Jenner along highway 1. It has one of the few sheltered coves with boast access. There is twenty acres of campgrounds with oceanfront locations or ones secluded in the trees a bit back from the bluff. At Ocean Cove Campgrounds there are over one hundred available campsites to choose from. 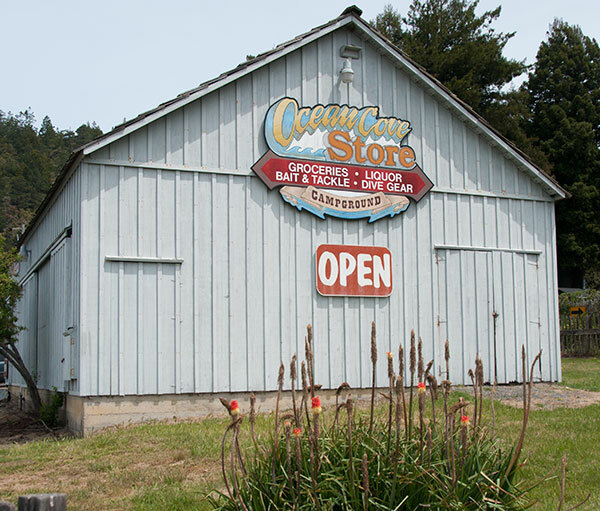 There is a local general store for provisions. You can stay at Ocean Cove Lodge and eat at their Bar and Grill. Stillwater Cove Regional Park offers pleasant campsites with easy trails to hike. Enjoy the ocean by kayaking or fishing, before watching the perfect sunset. This 210 acre park offers picnic facilities and a spectacular view of the Pacific Ocean from Stillwater Cove. The park has open meadows mixed with coastal forest. There is a half-mile trail leading to the historic one-room Fort Ross Schoolhouse. Stillwater Cove is popular with small boat operators, skin and scuba divers and abalone divers, as it provides ocean access and a small beach. A beach launch facility is available for people to load and off load their boats or kayaks. A portage to the Cove and the ocean is within a short walking distance of the launch. The launch is open throughout the year. No parking is available at the cove itself. Parking is available at Stillwater Cove Regional Park's day use parking lot. Ocean Cove was first surveyed by J.C. Conway under instructions from the United States Surveyor General on October 18, 1860. It then bordered the southern edge of Rancho German which is now Salt Point Park. At that time the property was owned by Fred and Anna Liebig, the first recorded owners. The Liebigs had built the first home there in 1857 and they established a small store in 1860. The property was purchased by W.J. Walsh on October 14, 1889. Mr. Walsh named it Walsh Landing. Timber was harvested in the surrounding area, then loaded from the bluffs onto "Dog Hole" schooners, and sent to San Francisco. The Columbia Movie Studio purchased the property in the early 1930s to make a movie. They built six cabins in back of the store to serve as living quarters. After the movie was completed they sold the property.